Q: What are your reasons for saying there is no property bubble? A: A property bubble occurs when there is a profusion of credit, when credit is easily obtainable and when credit is cheap. None of these are true where Sri Lanka is concerned. Getting credit is very difficult because our banks are very prudent, and thankfully so, and all of us know that credit is not cheap at all. What happened in places like UK post-Northern Rock is not something that can happen here, neither is there the frenetic euphoria about the real estate market that happened in Dubai where people were literally queuing to purchase and in certain instances reselling while still in the queue. In Dubai, most of the buyers were foreign and developers were local, in Sri Lanka the reverse is reality. Those are the type of phenomena that lead to a bubble. Another example is the toxic credit that was very easily available in the US; none of those things are here. When you look at the data, less than 10% of the luxury apartment market in Colombo is financed through loans. It is over 90% equity financed. So there is no pressure of financial payments, there is no case of immediate resale, and it is not speculative purchasing. To give a small example, we have sold 270 apartments, from 404, to our knowledge, (and we would be involved in such a process), only two have changed hands so far. Moreover, about 60% of the buyers are domiciled Sri Lankans, about 30% are expatriate Sri Lankans, and only the rest for foreign buyers. This has a dual advantage because the buyers are far more rooted in Sri Lanka and not considering the property purely as an investment. As foreign buyers are less than 10%, the potential for expansion is massive. We have literally not even scratched the surface of the international interest that could be generated into Sri Lanka as a real estate destination. Also, Sri Lanka has a very low ratio of urbanisation – Wikipedia puts us at 15%, the UN at 18% and the Government estimate is 48%. Even if we are to use an average of 27% as an example, it is way below global figures which are over 50% with smaller countries showing higher ratios. So the only way forward in terms of residential development is up. Q: You said that as much as 90% of the purchases are equity. How do you feel this impressive amount of money is generated? Is it a case where people are selling land outside of Colombo to finance the purchases? A: I suppose these are top professionals and businessmen who have gathered savings over time and regularly earn well. When you move around Colombo, it is obvious that there are plenty of people with substantial amounts of money and they are free to invest where they wish. We feel that the segment least vulnerable to a bubble is the luxury one because those who buy apartments, for the most part, do not borrow. They have ample funds, so they can weather it out, even in the very unlikely event of a market downturn. They don’t have the banks sitting on their tails with higher interest rates, and having to finance those banking loans. Developers who go into luxury are huge, very well established companies. We have Fortune 500 companies investing in the luxury segment along with top local blue chip companies like John Keells Holdings, Abans and with respected builders. These are all well entrenched, sound companies that do not necessarily have to come into Sri Lanka. They come here because they obviously do not have to worry about volatility and they don’t need credit to fuel their operations. There is no exposure. Q: About 90% of buyers are Sri Lankan. Do you think this trend will continue or moving forward, will the industry see more foreign buyers moving in? A: I have, over the last decade, seen quite a number of repeat buyers. It is a natural progression of wealth and the broadening of that base, which happens in any well set economy. I’m reluctant to use the word thriving but Sri Lanka is growing and the ripple effects of that is seen in the wealth that is available for distribution. Q: Is there not a danger of repeat buyers driving up prices and limiting accessibility for young, first-time buyers trying to find a price point they can afford on a middleclass salary? A: I think that phenomena would occur when you talk about restricted land availability. There is a finite amount of land and this would push away aspirational buyers, but that would happen in terms of real estate because prices are linked and land prices are a component of that. The only redeemer in this situation would be the condominium, because if you do not have it, then quite opposite to what is feared, the land prices would go far higher. On two acres of land we are building 404 apartments. If we build houses the maximum number would be 53 houses, which would not be possible because the construction can only cover about 65% of the land and there have to be access roads. That would reduce the number to about 34 houses. Condominiums are really the answer to the land problem. The city of Colombo has narrow roads and traffic is a massive problem. We are seeing a trend where people are even keeping apartments for weekday living, and we are seeing families coming back from the suburbs. Q: Are you concerned about the affordability of apartments? A: That is more of a generic national problem. The cost of land is high. Therefore, if people buy land outside central Colombo then the cost of transport and time is high. If you try to build a 2000 square foot house in Colombo that would cost you more than an apartment. Our apartments started at $ 400,000, now because we have sold 70%, the cheapest available is $ 525,000. Reason for the steep increase is twofold. One is availability, because the apartments are at higher levels and therefore they are more expensive and secondly, we have been pushing our prices higher. Altair is, I would say, among the best, but our prices are actually better than many other developers that are considered mid-range. Sometimes the larger developers help economies of scale filter down. Q: Since the Government is the largest holder of land, several companies have appealed for the release of more land to build mid-range housing for middleclass or upper middleclass people. Would you agree with this observation? A: Yes, this is a very valid request as there is a dire need for middleclass and upper middleclass housing within Colombo City limits or its’ immediate suburbs, and with well-designed condos, it will not take an overabundance of land to provide at least a modicum of a solution. For example, as little as 20 acres (even in separate blocks) could conservatively cater to as many as 9000 middleclass apartments or 7000 upper middleclass apartments. Of course there would have to be a rational in releasing lands to selected developers; perhaps “a Swiss challenge” method of selection. Quite apart from the delivery of a civic obligation, the Government would also save traffic infrastructure and lessen fuel wastage. Q: Coming back to the luxury segment, don’t you feel that there are doubts regarding its sustainability? A: My concerted belief at the moment is that it is sustainable. We have met with the Central Bank Governor and raised our concerns. According to real estate analyst JLL, of the available condominiums as much as 98% of what is available has been absorbed and 47% of what is in the pipeline till 2022 has also been sold. The Central Bank in a preliminary study has found 99% has been absorbed and 70% of the pipeline has also been bought. So in that case where is the issue? I don’t quite agree with the 70% figure, I personally feel that is high, but it still means the industry is doing well. Q: Do you feel apartments coming up in Port City would lead to a change in prices? A: That is a different dimension altogether. The Port City is a different animal and it is not going to prey on or absorb the existing demand, necessarily. There vision is for it to be a nodal hub for the whole of South Asia and it is their challenge to put the different legislation, frameworks, and ramifications into play that will support that. Going by the way the Port City company is going about things, and the expertise they are tapping into both locally and overseas, and the seriousness and maturity with which they are approaching the project, you feel pretty comfortable they will achieve that. That does not mean our existing buyers will also not look at Port City but they will bring a different offering to the table. They will enhance the offering and broaden the field of play. 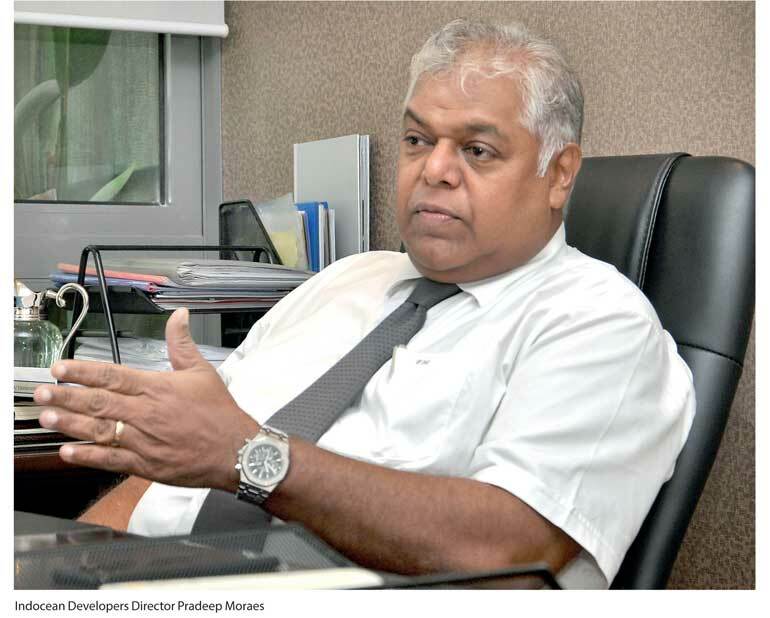 Q: Concerns have also been raised on ownership as some companies refrain from giving title deeds above a certain floor, particularly in areas such as Wellawatta. How do you view these issues? A: That may be the case but that is the due diligence each buyer is entitled to. If you buy a car, you check to see if everything is okay. For Altair, our agreement with the Urban Development Authority (UDA) is a 99-year lease and that lease converts to freehold upon us completing the building and transferring ownership. We jointly, together with the UDA, transfer the ownership to the buyer. The 40,000 sq.ft. of retail space does not become freehold but can become freehold with another signoff by the UDA. We have not applied for that yet. From the sixth floor upwards its freehold. Q: There have been reports developers are reducing prices to get pre-build deposits or are slashing prices. Have you seen such a trend? A: I hope not. The stakes are too high. You have to have some real conviction that you are going to benefit out of the entire thing by dropping prices or discounting on a thing like an apartment. I think that is foolish and hope we will not see that happening, any vestige of desperation or tinkering with sales policy because of the fear of any bubble would be counterproductive. Q: There have also been charges that large developers buy defaulted property directly from banks without going to the market and thereby get lower prices. What do you think of this? A: I’m not sure of that. If that were the case, I don’t see a problem. If I really want land, then I should have the ingenuity to figure out banks hold premium land and approach them and see what I can negotiate. That is a negotiating tactic any developer can employ. Q: Many international cities bring in laws to improve equal access to apartments in prime areas of a city such as regulating the number of vacant apartments and imposing rent controls. This is to ensure that people of modest incomes also have access to the same spaces and can enjoy the same standard of life. Do you feel similar steps could be taken in Colombo to create a more equitable city? A: I don’t think the market has matured to the point that we need to bring in those kinds of controls. There have not been malpractices that push for such controls to be brought in at this point of time. However, in the future as the market develops and different sectors form and if there are concerns there is nothing wrong with doing that, but I don’t think there is an immediate need. It could be premature overregulation that could undermine growth. If the industry felt such regulations are necessary and if the controls were supportive and judicious, then we may support such measures, but if authorities get very rigid and unreasonable then there will be the natural resistance that any commercial industry would have towards unwarranted regulation. Q: Experts have said a high percentage of private sector credit growth is directed at the construction industry and may need to be controlled for macroeconomic needs. Do you agree? A: Such a situation needs to be carefully studied. We don’t know if there has been a proper identification or if it is an assumption. If it is the latter then we must find out what sections of the construction industry are being fuelled and it is the responsibility of the banks to also exercise due diligence in ensuring that the credit they dole out is used for the purpose that it is supposed to be. I think it would be very useful if banks go into this and indentify which segment, the luxury, middle, or low, could be vulnerable. Also, is it going to the developers or is it going to the purchasers? Q: What policy measures do you see that would benefit the industry? A: Granting resident visas was passed in the Budget but has not been implemented. We are contending with places like Malaysia, half the Middle East, the whole of the West Indies, Greece, Portugal, Malta, and Spain, where reasonable investment gives them residency. We are not even asking for permanent residency, we are asking for a reasonable resident visa. An investment in real estate is the most tangible of investments so what is the danger that we are afraid of? There is no vulnerability. This is a ghost that is being created. There was also a proposal for 40% mortgage but I don’t think that much is necessary because these people are not going to come and borrow at our high rates. However, if we can give about 20%, then it shows a bank or financial institution has done due diligence for development. That is the assurance and hand holding that foreign investors require and they are used to. Once they get to know there is no local bank willing to do that little bit of ground work for them, they walk away. Real estate could attract significant FDI for Sri Lanka. A back of the envelope calculation shows that high end real estate can attract a very conservative estimate of $ 150 million per year; that is around 25% of last year’s FDIs. So it is clear that real estate can be a key player in generating inflows, and in our view, demands to be looked at by the Government. What we should be doing is comparing Colombo with any other capital city, rather than Colombo with what it was 10 years ago. The reality is real estate in Sri Lanka has never gone down. Even through the height of the war, prices continued to grow; that has been demonstrated in the luxury segment, selling even at triple what they were bought for.